Father Alex Andreou is a Greek Catholic priest, which means that he is a subject of the Roman Catholic pope, but otherwise follows the traditions of the Greek Orthodox Church. As a Greek Catholic priest, he was allowed to enter the priesthood as a married man. The priesthood is Alex’s family business and the Vatican is his world. His father was the seventh in a generational line of Greek Catholic priests. Alex lives in his childhood apartment in Vatican City, along with his five-year-old son, Peter. Alex’s wife, Mona, suffered a breakdown from postpartum depression not long after Peter’s birth and left her family. Alex’s adored older brother, Simon, is a charismatic Roman Catholic priest who is a Vatican diplomat. 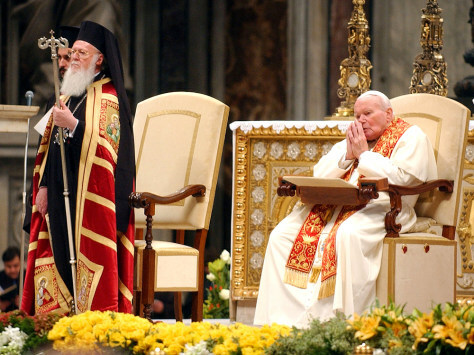 Like his father and then Pope John Paul, his passionate ambition is to heal the centuries-long schism between the Roman Catholic and Greek Orthodox churches. At the time this novel is set, the Pope is crippled with Parkinson’s disease and nearing his death, but still absorbed with this goal of rejoining the sects. Alex and Peter are in their apartment, eagerly awaiting a visit from Simon when he calls, evidently distraught, and asks for Alex to meet him at Castel Gandolfo, the papal summer retreat, where Alex is shocked to find Simon with the corpse of Ugo Nogara, a museum curator. Ugo is an old friend of Simon’s whom Alex was tutoring in Gospel theology to help Ugo with an exhibit at the Vatican about the Shroud of Turin. Years earlier, the Shroud had been claimed by scientists to be carbon-dated as being from medieval times and could not have been the burial shroud of Jesus. Ugo promises his exhibit will shatter what the world thought it knew about the Shroud. As if the murder isn’t enough of a shock, Alex and Simon return to Alex’s apartment to find that someone has come into the apartment and rifled Alex’s belongings, while Peter and his caretaker cowered in the bedroom closet. With Simon reluctant to fill Alex in on what might have been behind these two crimes, Alex begins his own investigation, calling on the many old friends and acquaintances who work at the Vatican as Swiss Guards, drivers and clerics. But the real solution may be the subject of Nogara’s exhibit and, for that, Alex’s expertise in the history of the Gospels is critical. 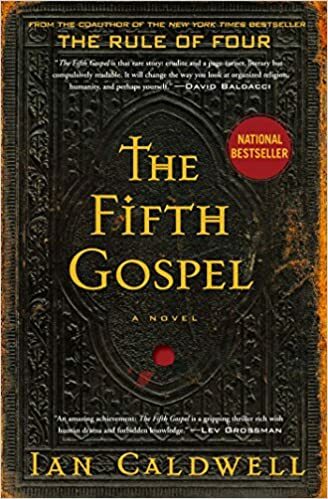 You wouldn’t think that a mystery that revolves around the intricacies of Gospel history and critical interpretation could make for a decent thriller plot, but it’s surprisingly compelling stuff. Caldwell has that gift of taking a subject you might not have any interest in and making it fascinating. It doesn’t hurt that he adds in lashings of intrigue, with different groups within the Vatican favoring or implacably opposing any reconciliation with the Greek Orthodox Church––a reconciliation that would have to overcome centuries of hatred and mistrust, due in large part to the violence and plundering visited by Catholic Crusaders on the Greek Orthodox Church in Constantinople. If you’re looking for an action-heavy thriller, this isn’t it. The plot plays out deliberately and works more cerebrally than physically. This isn’t just a thriller, though. Unlike so many thrillers, the focus is at least as much on the characters, and on history and ideas. And, with hardly a whiff of romance, this is a novel that is overwhelmingly about love. Love of family, of God, of friends. The kind of love that changes lives and leads to bonds that can’t be broken and to sacrifice. The novel is a bit of a slow starter, but as I read on it became completely engrossing. I think it’s important to say you don’t have to be a believer to find the story and its characters compelling. I’ve heard some people mention The DaVinci Code in connection with this book, but this is nothing like The DaVinci Code––and that’s a good thing, in my opinion. A note about the audiobook: The narrator is Jack Davenport. If you watched the NBC series Smash, he played the libidinous English director. He has a voice like Irish Coffee and, to be honest, he could read me an insurance contract and I’d keep listening. Really appreciate your thoughtful, articulate reviews. Real reviews, not annotated shopping lists! Betsy, thank you so much. I'm going to get a big head! Do androids dream of electric detectives?